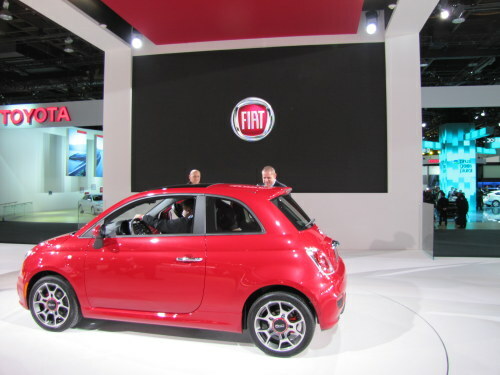 One look at Fiat at the 2011 Detroit Auto Show and you wonder when there will be a Fiat that runs on natural gas. Surely, the company led by Sergio Marchionne has the technical leadership experience and now the American brand identity with Chrysler. Fiat is certainly no slouch when it comes to automotive technology. Witness the common rail diesel technology, which it sold to Bosch during a financial crisis. Fiat also has ownership of the Multiair system, which it licenses to other manufacturers or provides entire engines; some which will show up on Chrysler vehicles. According to a Bloomberg report, Fiat is deemed the market leader in Europe in natural-gas engines, with an 80 percent share of methane-powered cars and 55 percent of light commercial vehicles. In Marchionne’s view, the U.S. has the natural-gas supply for the engines after becoming the world’s largest producer last year. Already, more and more stations are being opened for fleet use of natural gas. NGV Amercia monitors such events and touts them on their website. Still, the market is still in its infancy in the U.S., while Italy’s natural-gas vehicle market is one of the most robust in the world, with more than 800 fueling stations across the country. For the record, GM just began selling vehicles with natural-gas engines in the country this year for fleet buyers. And the Honda GRX is currently the only auto with compressed natural gas engines to retail customers in the U.S. While some say the lack of nat-gas stations is an infra-structure challenge, so are recharging stations for electric-car batteries; perhaps more so. Fact is, there are already 1,300 stations in the U.S. for the 110,000 vehicles using natural gas, according to the International Association for Natural Gas Vehicles. That compares to 160,000 gasoline stations, according to the latest stats from Petroleum Marketers Association of America.